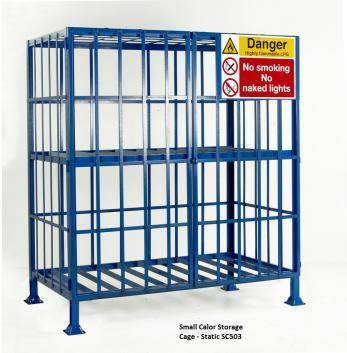 This sturdy design cylinder storage cage with hinged doors is one of the strongest ranges available for storage of gas cylinders. 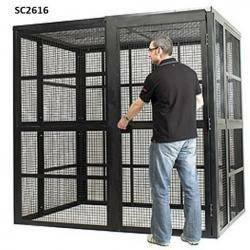 All our cages are fitted with padlock facility (padlock not supplied) with doors that will open through 180º. 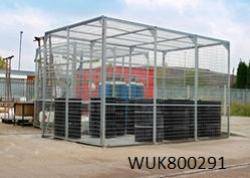 The cages are manufactured from Heavy Duty steel Box and Angle section and are supplied with Gas Storage warning identification label for your peace of mind. Simply select what size of bottle you are storing either Small Calor type ( 650mm height ) or Large Propane type ( 1690mm height ) . If you wish to make the unit mobile select Castors through the optional extras screen. If optional castors fitted Mobile model will be mounted on 2 swivel and 2 fixed castors fitted with 200mm blue resilex wheels and roller bearings complete with push handle at one end. Static model mounted on 4 pallet feet. Available with or without centrally fixed shelf: Fixed shelf model to carry a maximum of 16 x calor gas type cylinders (max 380mm diameter x 650mm tall). Open shelf model to carry a maximum of 8 x propane type cylinders (max 380mm diameter x mm x 1690mm tall). Finish: Blue epoxy.